Bus: Belize Buses travel the main highways of Belize. From Chetumal, Mexico to Corozal, Belize, south to Orange Walk, Belize City, west to Belmopan, San Ignacio and to Guatemala. throughout Belize and to Flores (Tikal) in Guatemala. "How to Get from the Cancun Airport to Corozal with your Wits & Wallet Intact! How to avoid the overpriced taxi rides and other pitfalls between Cancun Airport, Playa del Carmen, Chetumal and Corozal.". On arrival at Cancun Airport, go out through the main exit door and look the the Transfer Bus to take you to the other Terminal (Terminal 2) The sign says "Shuttle Bus Stop". This is a free service, so don't let anyone sell you on a taxi, and don't believe them if they tell you the last bus has already left - it's just a ploy to get you into their taxi! It is not usually more than a 5-minute wait for a minibus to come along.. The Transfer bus will drop you off outside the other Terminal entrance. Go inside the building, turn left and keep going left until you see the Ticket Desk for ADO & Riviera Buses.. Don't buy tickets anywhere else or from anyone else. Ask for ticket to Playa del Carmen, (In July 2004, these cost 65 pesos each) or direct to Chetumal if you do not need to overnight in Playa or Tulum..... If you are going straight thru to Chetumal the ride is about 5 hours and cost about $220.00 pesos each on the ADO bus (cost as of August 2008- ADO GL and UNO cost more because they don't stop in all major towns). Try to be at the bus stop 10 to 15 minutes before it is due to leave. To get to the bus stop, go out of the building, down the steps, turn right, and it is right at the far end of the building - you will see the bus stop sign. The driver will check your tickets so you can't accidentally get on the wrong bus. The Tourist Bus Station in Playa del Carmen is right in the heart of the town (as is Tulum's ADO Station). If you are spending the night here, collect your luggage from the bus hold, and exit through the door exactly opposite where the bus has stopped...Y ou will see a pedestrian zone (Avenida Cinco, or Fifth Avenue in Playa), and along it's length are lots of small hotels. If you are going on to Chetumal the following day, it is a good idea to book your tickets whil you are still at the Playa bus station the night before (In Aug of 2008 the tickets to Chetumal were $160.50 pesos each, Tulum to Chetumal is $150 pesos each.) Try to get a bus which leaves from the same Tourist Bus terminal, but if you can't, don't worry a taxi is only about 15 to 30 pesos and a 5-10 minute drive. Next morning, arrive 15 minutes before your chetumal bus is due to leave. Take your correct seat on the bus and prepare for a 4 hour journey. The first stop, after about 10 minutes, is the Mexican border. You don't need to take your things off the bus, just yourselves and your passports. They will stamp your passport (again!) and remove the immigration form which you completed to enter Mexico. You then get back on the bus. Next stop (in about 2 minutes!) is the Belize border Immigration and Customs. Here you have to take all your belonging and passports into the building, and wait in line. Here they may or may not ask you to open your cases for inspection...(Depends upon their mood). The bus waits for you on the other side of the border. 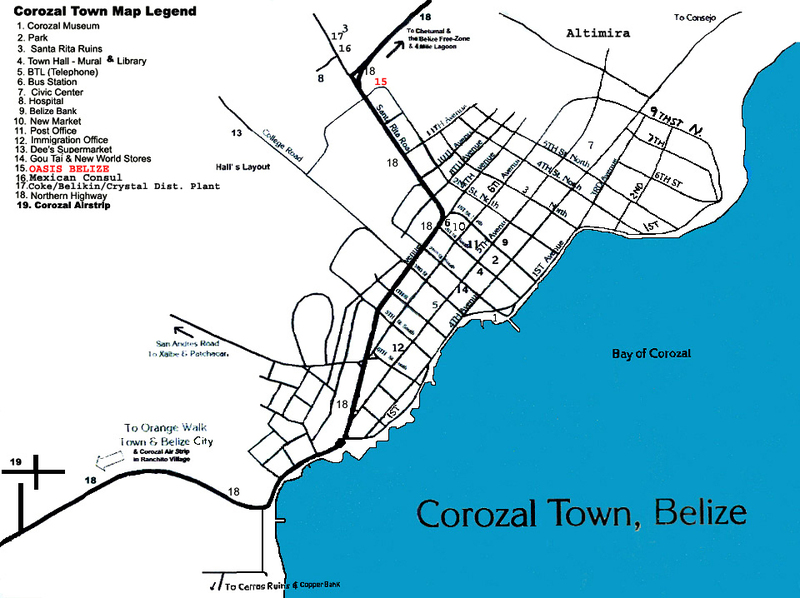 When Customs have finished with you, go get back on the bus by exiting at the end of building turn right and follow to parking lot, and in about 10 to 15 minutes you will arrive at the Corozal bus station.Welcome to Belize! A Taxi to Oasis (formally TJ's) will cost you $5.00 BZ (That is $2.50 U.S.) or if you want you can walk a few blocks back to the north (front of station - go straight- the market is behind the station), Fry's Grocery is about 1/2 way. We are behind Kentex Tires. Boat: A boat leaves from Cozozal Town to San Pedro, Ambergris Caye everyday at 7am and 3pm returns at 9am and 5pm. There is also a boat from Belize City and a boat to Caye Caulker. Click on thid pic to go to this website!